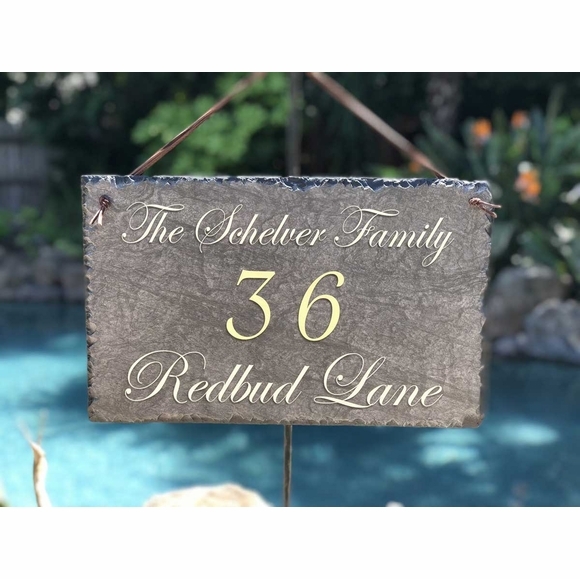 Slate 3 Line Address Sign - - features a very elaborate italic script and large gold numbers. Made in USA. Line 1 with family or establishment name holds up to thirty (30) characters. Line 2 with address number holds up to six (6) digits. Line 3 with street name also holds up to thirty (30) characters. Color: charcoal gray with pale yellow wording and gold numbers. Address in large image: 36 Redbud Lane.